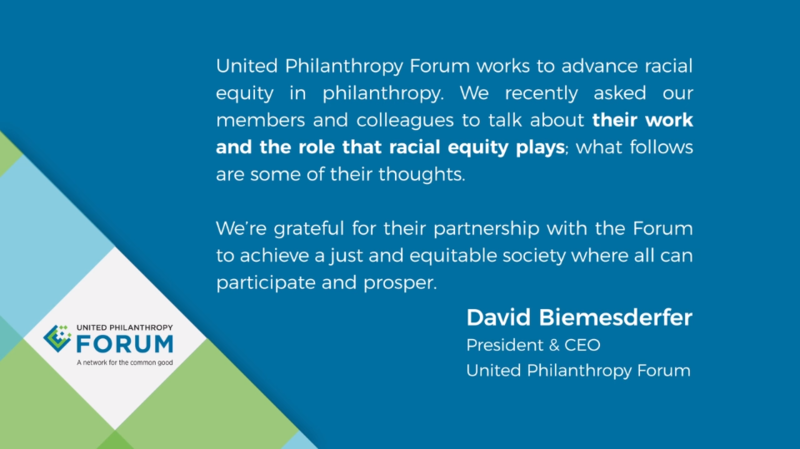 Many members of United Philanthropy Forum are working diligently every day to eliminate racism and advance racial equity, diversity and inclusion in philanthropy—helping philanthropy be more effective in reducing and eliminating the many racial and ethnic disparities that exist in our country in every area of social and economic well-being. This video highlights the role that racial equity plays in the work of our members and brings to life some of the findings of the Forum’s 2018 racial equity scan of regional and national philanthropy-serving organizations (PSOs). This is the second in a series of three videos we’ll be sharing to offer our members' perspectives on different aspects of racial equity. Our goal with these videos is to spark continued thinking and conversations on racial equity that will lead to action in our field to reduce inequities based on race and ethnicity.